Both Billy Hunter, the Executive Director of the NBA Players Association (pictured far left), and Derek Fisher, the player’s representative seemed highly offended and insulted by Stern’s latest comments. The wild card in the NBA debacle is the Penn State scandal, the NBA is getting secondary coverage from the media, thanks to State College. It would have to take a pretty serious situation to beat out the NBA Lockout for coverage and that’s exactly what happened. Jerry Sandusky, and everyone involved at PSU’s disturbing story, have taken hold of the media, and rightfully so. People have been so captivated and disturbed by the PSU child molestation claims, that the NBA seems to have been placed on the back burner. Now, people are missing the point that the NBA Lockout is extremely unnecessary and fueled by greed. However, both sides have honest reasons for the decisions. Josh Childress, who seems to be one of the more informed players during the lockout responded to this question on Twitter, “Is a 50/50 BRI split truly unfair?” Childress responded, “it is when we were at 57% before and have already given back a BILLION dollars over 6 yrs.” While that may seem greedy, the old cliché still applies here, this is a business, and players aren’t willing to give in. Now, the offer has even dropped from that 50/50 split Childress referenced and things look to be going down hill. On Sunday night Miami heat superstar Dwyane Wade posed this question on his Twitter page, “Why are all your ‘system solutions’ only impacting the PLAYERS?? What have the owners giving up of significance? ?” And as one would expect, the NBA’s official Twitter page responded saying, “The economics & system favored the players in prior CBA. Teams lost over 300m last year.” While this seems like a “boo-hoo” moment for both the players and the owners, 300 million dollars is a lot of money to lose in one year. Even if the owners are extremely rich, no one likes to lose money. The smaller market teams like Milwaukee, Charlotte, Cleveland, and many others, struggled to make a profit in the previous deal. How would you feel if your small business was annually losing money? On the other side of the equation are the players, who had been tweeting/claiming that they are “on the fans’ side” and that they only want to play basketball. Well, that is clearly not the case now as the Players Association, as a whole, rejected the owners’ offer. 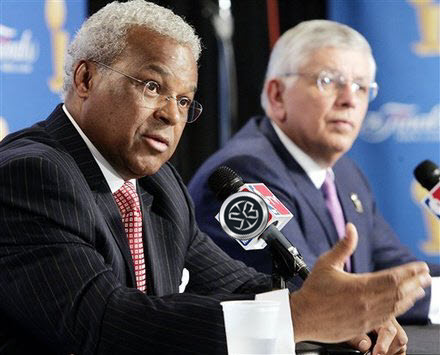 Last night David Stern said, “They (the players) walked away from an offer that would not have had a roll back of existing contracts, it would have had guaranteed contracts, and it would have taken the average player’s salary from somewhere in the mid five million dollar range to between seven to eight million dollars over the life of the deal.” That makes the players seem like the bad guys here. Stern is very good at doing that, he is a smooth talker and he has a knack for seeming to come out on top. The possibility of missing an entire season seems very plausible, if not likely at this point. Former player and current TNT host Charles Barkley has always been known to tell it like it is, and ever since day one of the lockout he has been claiming that there will not be a season at all. Sir Charles is looking like a clairvoyant now, because with talks going further and further south everyday, no one really knows what or when a deal is going to take place. ESPN analyst Chris Broussard was on SportsCenter last night and had some very interesting things to say. Broussard talked about how if the Players Association takes this to court, the season would definitely be over and the case would be settled over a few months, if we get lucky. However, if we don’t get lucky, the case could take several years to settle. Broussard also mentioned that there is a slim chance that the Lockout could be ruled illegal by the Federal Court, like we briefly saw with the NFL Lockout, and play would resume sometime during this calendar season. Whatever happens, one thing is clear. The NBA, and every other professional sports league, does not care about the fans. Every league is a business first, and a sport second. We are even seeing this in the NCAA as conference realignment has screwed fans over. The legendary Big East basketball powerhouse has been broken up. The geographical location of a schools now seems to have no power in deciding what conference they will be a member of, as we saw with TCU’s near move to the Big East. Sadly, it is clear that money runs the world, specifically the sports world. And as the Notorious B.I.G. famously said, “Mo’ money, mo’ problems…It’s like the more money we come across, the more problems we see.” We hear ya Biggie, we hear ya. I agree to an extent. As a fan, I think the bickering is driven by greed for sure. However, do you think the NBA could benefit by taking a year or two off much like the NHL? The NHL’s collective bargaining agreement is great. Obviously, big fans of the NBA wouldn’t be happy, but the truth is the NBA doesn’t have a lot of big fans. Perhaps a year or two of players taking their games overseas to learn new aspects of the game could improve the NBA’s product. Also, big leagues do care about the fans. It is a business first, clearly, but to say the fans play not even the smallest bit into the equation is ludicrous. Without fans, there is no reason to have organized sports. Our role should be larger, yes, but to say we have no role is a far reach. That’s true they do care about the fans, but I don’t think I ever said that they fans don’t play any role, it might have seemed insinuated though. And that’s a good point, if they played overseas it could make the game better. But I think overall, it would damage the NBA if there were no season this year. The Mavs are aging, The Lakers are aging, and the League is at a recent high in interest compared to past years with the Heat, the Knicks, and the Bulls all relevant. I also think people underestimate the amount of big fans the NBA has. I think that there are a lot of them, especially in the urban community, who don’t necesssarily buy tickets or watch most games. I honestly think the NBA should be concerned about losing fans in the long run if this happens. Oops, just saw where I said the NBA does not care about fans haha, my bad.